We’ve owned a number of portable jump start units, but we were really impressed with Husky’s new offering — which not only serves as an effective starter, but also adds a 400W inverter, an air compressor, and a 12V power outlet. If you’ve been thinking about buying one of these, read on for our hands-on impressions and lots of photos — this unit impressed us, and it’s quite affordable. The Jumpstarter System ships in a good ‘ole standard foam-packed cardboard box. Our particular unit seemed to arrive safely with no marring or other damage. Once you’ve got it out of the packaging, a few features really stand out. The most noticeable is the lack of an external power “brick.” The ‘System’s 110V charger is integrated internally in the unit, and only outward indication of the charging system is a deployable male three-prong plug on the back. To charge it, you rotate the jack out to un-stow it, then plug in an extension cord. We have an older multi-function-jumpstarter around the shop, but we long ago lost the charger brick; Husky’s arrangement seems much more sensable. We’re also impressed with the arrangement of the ‘System’s jumpstart leads. Rather than storing them in a separate bag — or allowing them to lay loose or wrapped around the handle — Husky added open-topped square boxes on the back of the unit to hold the wires in place while the leads themselves clamp onto nearby studs designed to keep them in place. As you can see in the photos, this arrangement leads to a clean, easy-to-use layout that keeps the leads from catching on things when you load the unit into a trunk. A door on the back opens to reveal a compartment perfect for stowing the remaining power cable and the air compressor’s air hose. A three-digit LED display on the front panel indicates the current battery voltage (when you press the appropriate button) to indicuate the charge state of the internal sealed lead acid (SLA) battery. A rotary switch to the left of the LED enables jump start power. A switch below the LED activates a three-white-LED flashlight mounted nearby. A pressure gauge for the unit’s air compressor is located to the right of the LED, and the switch to activate the air compressor is right below the gauge. A door below the main front panel allows access to a 110V – 120V plug — powered by the unit’s 400W inverter — and a 12V DC outlet (cigarette lighter style). A switch activates the inverter. On the whole, the ‘System seems quite durable. Door hinges and latches seem quite solid, and the handle itself is integrated into a small “roll-cage” design that further protects against impact damage. The handle’s grip is comfortable, which is important since the unit’s quite heavy due to its internal battery. A rubberized mat around the bottom of the unit makes it “stick” to smooth surfaces (and carpet) a bit, which keeps it from sliding around in the trunk. Read on to page 2 for our experiences using the Power System. 1: How much capacity do you need / weight do you want? The “marketing number” seems to be inverter wattage, but the useful number is battery capacity, in amp-hours. 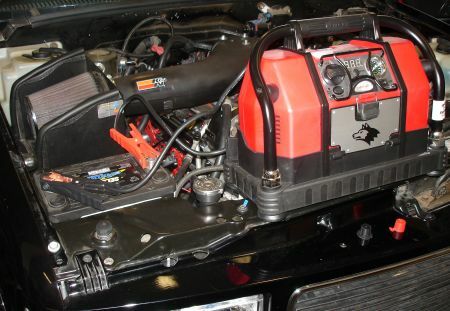 A bare minimum for jumpstarting engines should be 12AH, and look for 20AH if the unit’s likely to be cold while you’re using it. (Lead-acid chemistry is *very* temperature-sensitive.) Don’t be fooled by a high-wattage inverter mated to an inadequate battery. 2: Is the battery treated properly? All the jumpstarter packs I checked out at Harbor Freight were discharged, and had probably been that way since they shipped from China. Lead-acid batteries are damaged if they sit for long with less than 80% charge, and anything below 20% for more than a few hours is just murder. Also, does the charger have any sort of regulation to prevent overcharging if you leave it plugged in? 3: Is the battery replaceable? Even treated right, lead-acids in this type of service are only good for 4 or 5 years. The inverter, clip leads, and case will probably last much longer. Make sure the battery is a standard size, and that you can change it without having to glue the unit back together when you’re done. 4: Are the accessories built to last? If you’re looking at a unit with an integral air compressor, make sure the hose is stored thoughtfully. Cramped corners and tight bends will kill cheap rubber hoses, and they’re often a pain to replace. The last thing you want is a bulky, expensive, heavy unit whose bulk, expense, and weight are due to a failed or otherwise useless compressor. Are the jumper cables long enough that if a clip hinge gives out, you can replace the clip and still have some useful length? 5: How are the ergonomics? As this review points out, having the clip leads stored on the unit itself can be nice. Xantrex opts for separate leads that plug in, which is great if you’re primarily using the unit as a portable inverter, but would quickly get annoying if you’re just starting a lot of cars. Personally I’ve always found that the built-in lights are somewhere between useless and hostile, because they invariably shine at my face, rather than my work. Until someone puts a gimballed light in one of these, I’ll opt for a separate flashlight, thanks. I saw one pack with an integrated charger, normally a handy feature, but you needed a special narrow-nosed extension cord to sneak in and plug the charger in. All the weight of a wallwart, all the bulk of an integrated charger, all the clutter of carrying a special cord! 6: What’s the recharge time like? My brother lives in Buffalo, where heavy snow on still-leafy trees recently knocked out power for over a week. (From his own backyard, he could see *several* tree-meets-wire altercations. Multiply across hundreds of square miles and it’s no wonder it took the utility a long time to restore service!) He was running a laptop, a cellphone, and a carbon monoxide detector from his power pack at night, then taking it with him to the office (on a different part of the power grid) to charge during the day. Obviously, the more power he could replenish in 8 hours, the better! If the unit’s AC charger is a wimpy 1A wall-wart, that’s only 8AH, and because of Peukert’s theorem, only about 6AH of that is usable. Charging straight from a high-amperage DC source (like a running car) can be much faster, but is harder on the battery. Great review! I have been looking for a decent portable air compressor and this might just do it for me. I received one of these as a Christmas gift last year. We (my wife and I) are happy with the unit. I leave it in her Suburban “just in case”. I’ve brought it to jobsites that didn’t have electricity (great for a radio or a spotlight). I have even been able to use it to charge up my two battery system in my truck (24 volt system). We’ve mostly used it to give other people jumpstarts. I recommend all husbands buy one of these (or a similar unit) for their wife’s car. They’re simple to operate and they hold a charge for a long time. Just don’t do it as an anniversary present, unless you include a really big box of chocolate. Forgot to mention that the latch broke off in the first month we had it. Only complaint. Owned a husky portable power system for about 18 months,finally used it for something other than battery power to run my c-pap, flat truck tire,,new, got to 30psi, timed out, cooled, ran again to near 40psi, sound of compressor suddenly changed, now runs but no air. I’ll let youknow what home depot does. Nice piece of equip to have the little compresor ruin all the good features. Hope they make it good? Just bought one with a Home Depot gift card. One thing that was mentioned was that lead-acid batteries are damaged if they’re stored with less than 80% charge (point 2 in the first post). The manual advised to charge for 24 hrs before using, but I noticed right away when I plugged it in to charge, that the battery was full, so it seems these are shipping with enough of a charge to keep them “healthy” until you buy one. I hope this unit works as well as some of the reviews have said it does. I’ll report back if the compressor breaks. Can a jumpstarter unit like this also be used as a trickle charger if needed? I want to get one of these Huskys, but right now I also have gate opener battery that needs a trickle charge on a setting of 12 volts dc and 2 amps or less. It would be great if this could do the job. The chargers included with these packs, whether they’re external wall-warts or built-in, are generally unregulated. (The exception being Xantrex products, which are nicely overengineered.) Leaving any battery connected to an unregulated power supply will overcharge it. An occasional carefully controlled overcharge is an “equalizing charge” and is a good idea, but aside from that, disconnect the charger as soon as it’s done. If you’re talking about walking out to the gate-opener with the Husky and clamping it on to transfer charge into the opener’s battery, that’ll work but it’ll never get the recipient battery up to 100% charge. Every few months, bring the opener battery into the house and connect it to a “12 volt” wallwart for a topping-off. Even so, spending most of its time at low state-of-charge will shorten the opener battery’s lifespan. A much, much better option would be to get a small solar panel and a charge controller. If it’s shady there, you can even put the panel some distance from the opener, since the currents involved are so small the voltage drop in the connecting wires should be minimal. (18ga landscape-lighting cord is great in this application.) The charge controller is essential to keep the battery from overcharging, but once you’ve got it all hooked up, you should be set for years. This is my first- time blog entry (I’m totally new to blogs). I found the Husky portable power system at my local homeDepot (I haven’t bought one yet – I’m on a budget). This power system is much larger than any I’ve recently seen on the automotive market. Husky doesn’t specify on its packaging how long a single charge lasts, for say powering a vehicle. The tool blog which I’m commenting on doesn’t specify this either. Is there anyone who has further experience with this power unit, who has used it for longer durations? I own a kiln (Its heat capacity rated at 2.900*F) that I haven’t used as yet since I bought it. Is the Husky portable power system strong enough to handle such an appliance? Can the “Toolmonger” Blog answer this question? I unfortunately have two unusable power packs. I cannot use the first one I bought because the part that fits over the tire stem gets stuck on the stem. I was able to remove it with great difficulty. It ruined the stem on the tire. The second one I bought is also tough to get off. I cannot use it now because the latch handle that locks it on the stem broke. I have had to go back to use my 20 year old portable Campbell-Hausfield compressor when I need air. What a disappointment. anyone know how to replace the battery on this Husky ? It ‘s well built and cleverly engineered, but I can’t figure out how to open, and replace battery. The instruction book recomends taking into into the shop, but Husky now owned by B&D, who no longer makes this model and will not fix it. this machine is a quality pieces of equipment a shame to throw it out . Best bet is Batteries Plus, they usually can match or offer a sub. They may have already did such a replacement and could help. Had the same problem, just purchase an extended stem which are longer at the top and it will work fine. It will thread onto your existing steam. Autozone or one of the others and they are cheep. We bought the Husky portable AC/DC power system. It’s smoking when you use the compressor(burning wire smell). According to Husky website, they do not have a model HSK037…Home Depot says I have to bring it in and they’ll send out for repair. 800# says take to store and they’ll replace. No # found to speak to Husky directly. Suggestions? Have others had this problem? It looks like the compresser is the weak link. Mine mysteriously stopped working alltogether about a month ago, then when I brought it in from the garage to get the S/N etc, to give Husky/Home Depot a call, it fired right up. I supposed it could have been cold, but it’s summer here and my garage hasn’t dipped below 70 degrees. It also seems that from an 120V outlet will stop powering some devices when the votage meter gets down to around 11. Other than that, it’s a nice unit. Hey all. I’ve a question. Has anyone just lost the ability to check the charge using the button? I noticed it wasn’t lighting up when it was charging (as it should do) then realized once it was charged, that I couldn’t check the charge level….nothing lights when I press the button. Anyone else have that problem? I used the compressor for the first time today and i was able to only inflate one small tire before i heard the compressor just run and not pumping. I heard something rattling around in the casing and found out after taking it apart that the pin that is on the motor came loose from the pump so i replaced the pin and works fine now. only proble is, is how do you keep the pin from falling out again ??? Purchased HSK037 from Home Depot in Dec 05 – compressor does not work – clicking sound when Compressor switch “ON” – all other functions OK. Is there a simple fix? I am looking to purchase several units of Husky portable power supply and I like to find out the best price you can offer. I own a Towing Company, use jump boxes ALOT! Love the Huskys the most as they are definetely the longest lasting. My problem? I need two more and Home Depot says they don’t carry them any more. I’ve looked everywhere and online and I can’t seem to locate a dealer that sells them. HELP! Mine has a dead(ish) battery after about 5 years. It won’t even trip the solenoid on a vehicle anymore, but might run the inverter for an hour or so… I started several cars with it when it was young, it worked fine. The battery that will fit is a UB12180, about $33 delivered from Buy.com I like this unit so I’m going to put a new battery in it. 18AH vs 19 that was in it. A UB12220 will also fit, but costs more than 2x as much. There are LOTS of screws to take out, some under stickers, etc, so take it all apart, inspect for more screws, take more out, etc, etc… But it will come apart easily once you find them all… Should make it like new again for another 5 years. I’m going to refrigerate it after I charge it this time, since I only take it camping maybe 5 times a year. Might last 7 years that way. Took me a while to find a battery to fit, but it is a standard size. Measure the battery near the top of the case (it is tapered) and you’ll see it matches a bunch of replacements… Must be a sealed battery. Kathy Gean – xantrex has a nice one at Blain’s Farm & Fleet on sale for about $80… Actually I think it’s a duracell powerpack 450 (made by xantrex). Looks really nice & has same features, plus xantrex is a great brand, but I thought I’d stay with the Husky once I replace the battery. I don’t see it online, but if you have a store nearby, it’s black with orange handles, and that would be a great price if you can find one. Have a Husky AC/DC Power Supply and compressor. Everything works great except air compressor. You can hear the compressor motor run but no air. Took it apart and found that it has a cheap made plastic cog that is stripped. Anyone know where I can order the part? I have had this Husky for a couple of years and not used it often. Tried to use it again one time and battery would not charge. Anyone know where I might find a schematic for this unit? Or someone who might already know how to replace the battery? I have a Husky portable ac/dc unit with air inflator… Used the air inflator once, now it does not work. When using more air comes out of tire then goes in tire……. Home depot no longer carries this brand… What do I do ???? My HSK-037 wont charge. I hook the extension cord up and it won’t do anything. Anyone know about a fuse or something that I can check to get it to charge?? It’s a great unit, but I’ve only used it a few times. It would be a shame to have to trash it. It’s still “brand new”. And yes I know batteries don’t last forever… but it shouldn’t be the battery. Help please!!!! Chris, it’s possible that the transformer inside of the unit is either unplugged or bad. If you take apart the unit, you’ll see that the “AC” in is just a small wall transformer strapped to the plastic on the inside of the case. I just opened mine to replace the battery, based off of the info from Michael D Smith’s post above. I used a UB12180 battery as he had stated, and it works great. Just a side note, it is a REAL pain to take these apart. There is at least one screw under a label. There are no screws under the aluminum/metal panel labels, only under the cheap black paper labels on the bottom. (At least on mine.) It is also not strictly necessary to remove all of the screws on the back of the red plastic section. Some of the screws around the hose and jumper cables hold down plastic locks which prevent the cables from being yanked out of the housing. Depending on the amount of slack they left in the interior at the factory, it’s possible to replace the battery without completely removing the screws. Of course, it’ll make your life a little easier if you loosen them a bit. I have had one of these Husky jump packs for years (probably 4-5). Its a great little unit, and a shame that Home Depot doesn’t make them any more. If anybody out there has a chance to pick up one of these units used, even if the battery needs to be replaced, do so! You won’t be disappointed. My jump pack is in need of a battery now, and I plan on replacing it, since the price of the battery is still cheaper than the average new jump pack, that wouldn’t include all the features this one has. As a previous poster (Michael D Smith) said, you can replace the battery in these jump packs with a UB12180 (universal Battery 12V 18AH). And It’s most likely going to have the same performance as the DiaMec 19AH battery that came in the unit. But personally I am considering upgrading the battery to the UB12220 (universal battery 12V 22AH). One of the battery web sites I found showed a broad difference between the UB12180, and the UB12220. The UB12180 is rated at 247CCA while the UB12220 is rated at 420CCA. The two UB batteries have the same dimensions as the original DiaMec 19AH battery, so both should fit in the pack with out problems. If you Google search the UB12220, you can find them as cheap as $34+ shipping (mine will be $53.60 W/ the shipping). I look forward to extra CCA, and longer run times for the inverter! when i first brought the jumper box i was so pleased i showed it off to all the guys then the air pump stop working. i took it back to homedepot and they gave me another one and the samething happened this one and now the unit will not hold a charge so i went back to homedepot and they do not sale this unit anymore so what should i do? Lo siento pero esta compania es de los EU y no tenemos informacio por comprando las herramientas en Mexico. How do they get the current out of such a small battery as the 12180 or even the 12220 to start a car? Would it be possible to just take the big jumper cables from the 122180 without all the other “stuff” and jump a car? Where do you buy this? I’ve tried home depot online, husky website..this is bad marketing, I’ve owned this before, but moved to Hawaii and need another one.. This was a great little unit–I wish it were still being made. I bought mine circa 2007 just so I could power a little something if the power ever went out and have used it much more than expected. My compressor did not last either. I thought my unit was dead since the button that shows you the charge % does nothing and the little ‘charging’ lights don’t rotate when it is plugged in. But I just found that it is holding a charge and will try to plug it in overnight to see if there is still life left in this bad boy. i bought the husky hsk037 on march,3 2006 at home depot for $89.99 plus tak(i was living in new jersey at the time). i will say this much. first off i dont use the unit hard. it usually sits in my back of my volvo station wagon until it is needed to jumpstart or i use it for my cutoff tool at a junkyard. i HAVE NOT HAD A SINGLE ISSUE WITH THIS UNIT TO DATE! mind you it is july 23, 2012 when i wrote this review so thats well over 6 years. the battery on occasion has sat in low charge state for awhile, ive used the inverter to power a black and decker plug in “dremmel” tool as well as a jig saw and no issues. ANY INVERTER WILL SHUT DOWN WHEN BATTERY VOLTAGE REACHES 10-11VDC to protect the battery. the tire inflater was a bit tough(tight) at first but it breaks in and i have not had a single failure issue(remember oilless compressors of any size are not suitable to run continously for extended periods-it ruins the teflon seals on the piston) and a “bicycle tire” inflater will not inflate a semi tire in one go without damage. the latch “popped” off mostly because it was my fault as my vehicle is a moving “junkyard” due to the 300,000 plus miles on the od. (never leave home without spare parts bc it is when you do that failure occurs like the vehicle has ears lol) but latch i just found the latch and the small metal pin popped pin back into latch and latch onto unit and voila! its a bit hard to pop back on though but it just tells you that the plastics husky chose(well victor they made this unit) were of quality grade. its seen all temperatures, been bounced in a trunk, red “paint” on plastic starting to fade due to sunlight, but this unit has well outperformed my expectations. and shes still going. its a worthy investment to get ahold of one of these babies. if the battery is flat its not all that hard to replace. it does have screws you just need an angle but ive never opened mine so im not sure what angle but theres always an angle to doing stuff. the inverter is also fan cooled which is a huge plus. i tried using it as a battery charger but it will say full and not drop so basically the charger will only handle its own internal battery. correct me if im wrong here. it can be charged a bit vuia the cables but beware doing this no more than a few mins. youll KILL the battery in it. same for cig plug charging 4 hours tops like manual states in EMERGENCY only. it will never overcharge either the built in meter/charger circuit assures that. if i saw another at yardsale or secondhand(as they are no longer made) i would snap it up irregardless of the issues and fix it up as a spare. and i have used it to start 2001 durango in cold weather no problem, even when it has been sitting in my closet a year and not recharged after useing it!!!!!!! I HAVE ONE OF THE HUSKY PORTABLE AC/DC POWER SYSTEM. I JUST WANT TO USE IT FOR LIGHTING IN CASE THERE IS NO ELECTRICITY IN THE HOUSE BUT I DON’T KNOW HOW TO CHARGE IT. CAN YOU PLEASE HELP. The plug in in the back at the top. Lift up the black rubber flap. Get a good cord and plug it the wall outlet. The front display will circle until its charged. When it is ready it will say full charge. Anyone have detailed info on how to disassemble these to replace the battery? Batteries Plus told me they would replace the batter if I bring it to them and buy a battery from them. My air compressor quit. I took apart the plastic switch and it was corroded inside. Cleaned it up, put some dielectric grease inside the switch, reassembled, and now the compressor works fine. Now to find out why the charge indicator doesn’t display. How do i know the battery status after charging or during usage? look aat this aand understand this side of your story. It’s surprising you aare not more popular ssince you surely possess the gift. The first battery lasted 5 years, the second, six. I’m happy with the UPG UB12180 and will be buying another. I take it camping all the time for lighting, and use it for lighting when doing work under the vehicle. Not bad. Inverter and compressor still fine after 11 years. I have had the Husky battery charger,for a few years.I only use it once.The next time I went to use it,it would not work. I am very disappointed with this product.Now I have this big heavy item in my shop just taking up room. This item is to heavy to ship for repairs,I have not seen any where that I may take it for repairs. I would not purchase another. The unit belonged to my late husband. Am not sure when he bought it however, a whisper of air escapes the little hosr & the charger only goes up 9.4 on the gauge. Seems to me now it should just go to recycle…too huge/heavy to be a paper weight. would like to find a price for a Husky portable power system.